Cedar Rapids, Iowa – Cornell College’s Hilltop is getting green with the help of our company. The college in Mount Vernon, Iowa is using energy efficiency to enhance its facilities for the benefit of students. Cornell College recently completed several energy efficiency projects as part of its renovation and addition of the Thomas Commons building. Projects included the installation of lighting designs and controls, heating, ventilation and air conditioning (HVAC) system and new insulation. Thomas Commons serves as the hub of student activities on campus and houses the college’s dining facility. The college expects the energy efficiency projects to reduce energy usage and increase cost savings. The projects were completed under Alliant Energy’s Commercial New Construction energy efficiency program. Cornell College expects to achieve annual energy savings of nearly 17,000 therms of natural gas and more than 197,000 kilowatt-hours per year. The energy savings will result in avoiding approximately 226 metric tons of carbon dioxide emissions each year. This is equivalent to removing approximately 48 passenger vehicles from Iowa roadways or the amount of carbon dioxide sequestered by nearly 185 acres of forest in our country. In addition to the anticipated energy savings, the company received a rebate of $25,719 for the projects. 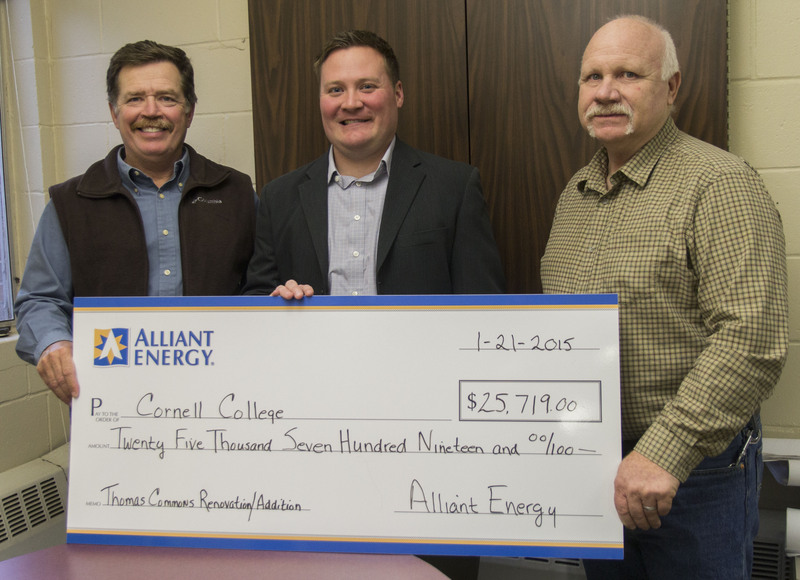 Chris Tompkins, Alliant Energy key account manager, presents an energy efficiency rebate check to Cornell College’s Joel Miller, director of facility services, and Jeff Mick, assistant director of facility services. We offer the Iowa New Construction programs to businesses and organizations seeking to implement new or innovative ways to reduce energy demand. Our company also offers a number of Prescriptive Rebate programs for companies looking to increase the energy efficiency of their facilities. These programs are available to Alliant Energy retail electric and gas customers located in our Iowa service area. For more information, visit alliantenergy.com/energyefficiency or call 1-866-ALLIANT (866-255-4268). CEDAR RAPIDS, Iowa – As winter continues, it’s a great time for Iowans to consider a free home energy assessment. Customers of ours can qualify for an assessment that provides specific information to increase the heating efficiency of a specific home. This can save money with out sacrificing comfort. Our Home Energy Assessment program helps identify energy loss, provides improvements that can lower energy use and shows which rebates can help make those upgrades more affordable. Many of these improvements are easy to implement and are no-cost or low-cost. For customers that qualify, the home energy assessment includes the free installation of lights, high-efficiency showerheads, clock-programmable thermostat and other energy-saving items. For only $100, customers can upgrade to a comprehensive assessment that includes additional home diagnostics like a blower door test, duct blaster and thermal imaging. These tests can further pinpoint energy waste. Following the assessment, the advisor creates a customized report, listing steps to further improve the performance of the home. To sign up for a home energy assessment, visit alliantenergy.com/homeenergyassessment or call 1-866-ALLIANT (866-255-4268). We’re excited to get to know our customers better than ever. We’re seeking Iowa and Wisconsin residential customers of all income levels and stages of life to join Power Thinkers, our new online community. Power Thinkers will collaborate with us each month through surveys and discussions, providing input on energy topics relevant to their lives. The more we know, the better service we can provide. To become a Power Thinker or for more information, visit powerthinkers.com. We have given Habitat for Humanity of Dane County a $15,000 grant to support a panel build this summer. Alliant Energy Senior Vice President John Larsen presented a check to Valerie Johnson, CEO of Habitat for Humanity of Dane County, at the Wisconsin-vs.-Iowa basketball game January 20 at the Kohl Center. 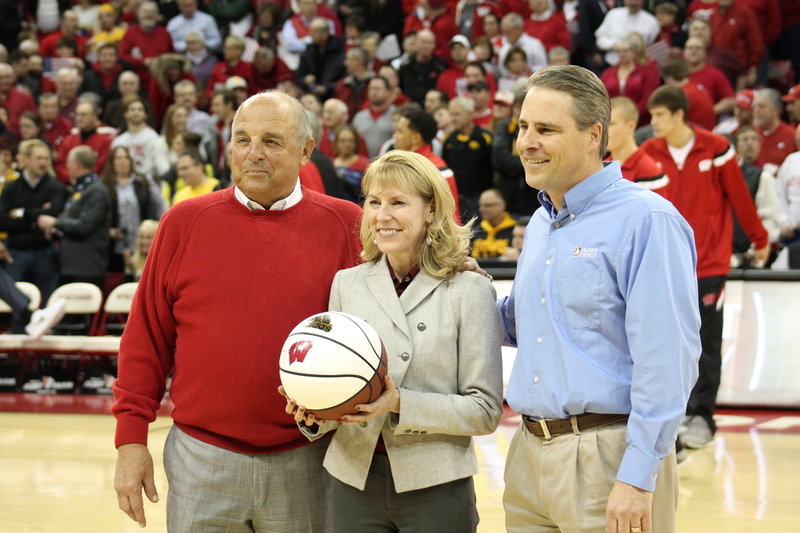 UW-Madison Athletic Director Barry Alvarez, Alliant Energy Senior Vice President John Larsen and Valerie Johnson, CEO of Habitat for Humanity of Dane County, appear at center court after Johnson was presented with a game ball before the January 20 Wisconsin-vs.-Iowa basketball game at the Kohl Center. We worked with a Sun Prairie family on a Habitat for Humanity panel build in June 2014. The Habitat for Humanity panel build will be the second one that our employees and retirees have worked on in Madison. Last summer, we helped a Sun Prairie family construct their future home at our corporate headquarters. 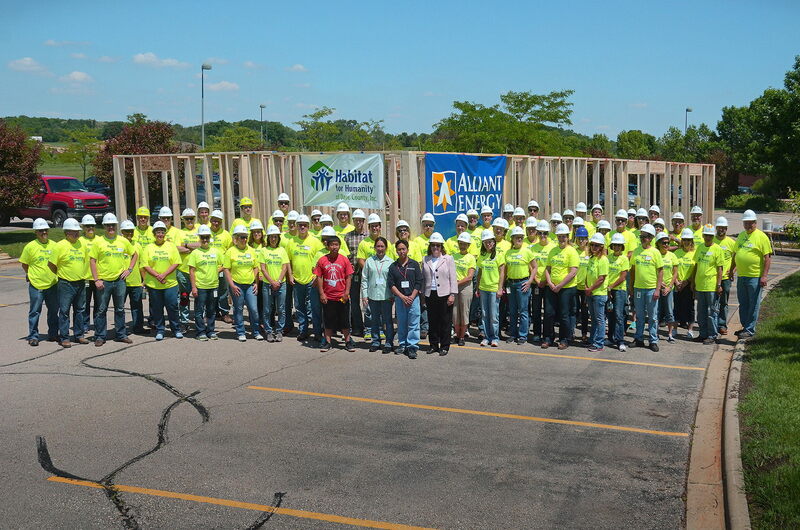 Our employees and retirees in Cedar Rapids, Iowa, took part in their own panel build helping a family in fall 2014. Thanks to our Custom Rebate programs, Heron Lake Bio Energy is saving money and helping the environment. The ethanol-producing facility in Heron Lake, Minnesota, produces 59 million gallons of ethanol annually. That is sold to petroleum marketers in Minnesota and across the nation as a clean-burning, high-octane fuel additive. Heron Lake Bio Energy expects to achieve annual savings of more than 2.25 million kilowatt-hours of electricity. That will cut carbon dioxide emissions by more than 1,500 metric tons each year – the equivalent to removing about 330 passenger vehicles from roadways. The company recently completed several energy efficiency projects to install new lighting, an air conditioning unit and variable frequency drive motors. Motor systems can account for about 60 percent to 70 percent of the total electricity used in an industrial facility. Energy expenditures can be 10 percent or more of the total operating cost. In addition to the anticipated energy savings, the company received a $235,006 rebate for the projects. Education about sustainability and renewable energy will be the highlight of a new project through a partnership with Indian Creek Nature Center, located in Cedar Rapids, Iowa. As part of their Amazing Space campaign, we will install a cutting-edge solar power system to provide energy for the Nature Center’s new learning center. Solar energy is key in making the new building sustainable and educational. An online reference portal will provide the public with real-time information on how much energy the solar panels are generating, and how that generation interacts with the needs of the Nature Center and the energy grid. This portal will be hosted on our website and Indian Creek Nature Center’s website. The online reference portal will be available after construction is complete, which is expected in 2016. The Nature Center’s current building features a 3.6 kilowatt (kW) solar system that they own, and we helped them develop in 2003. The solar energy system at the new building will be sized to match the energy needs of the entire structure, which is expected to be between 70 and 100 kW. We will own the new solar energy system. A certified Living Building is self-sufficient for energy and water for at least 12 continuous months. It must also meet rigorous standards for green materials and indoor environmental quality. This project is part of a 15-year educational partnership, and represents our first solar energy generation site. Dangerously cold weather has settled across the Midwest this week. 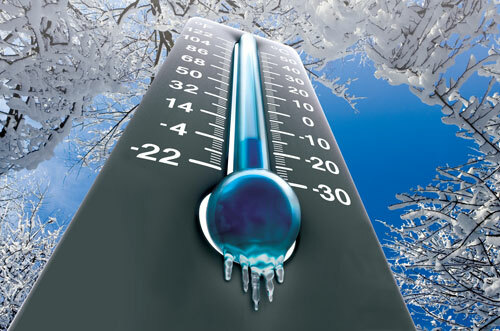 Follow these tips to stay warm and safe. Wear layers of lightweight clothing to stay warm. Gloves and a hat will help maintain body heat. Protect your pipes – run water, even at a trickle, and keep the thermostat up to help prevent your pipes from freezing. Keep the garage doors closed if there are water lines in the garage. If you are using a space heater, place it on a level, hard surface and keep anything flammable—clothing, bedding, curtains, rugs—at least three feet away. Never use a stove or oven to heat your home. Avoid using a conventional fireplace. Traditional fireplaces are an energy loser because they pull heated air out of the house and release it up the chimney. When not in use, keep the damper closed. Make sure there are no smoldering embers before closing the damper. Use generators correctly – never operate a generator inside the home, including in the basement or garage. If air isn’t circulating, deadly carbon monoxide fumes can quickly build up. NEVER attempt to hook up a portable generator to your home’s wiring.